NEW STORIES AND ESSAYS FROM TOP AUTHORS AND EXPERT SCIENTISTS. Explorations of how interstellar travel may affect humanity by best-selling authors and scientists. The stars will change us. 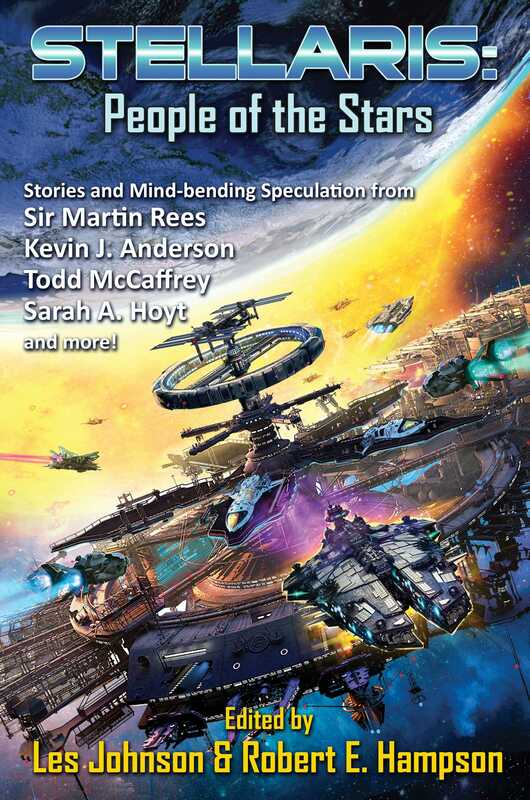 STELLARIS: PEOPLE OF THE STARS is a collection of original science fiction stories and nonfiction essays speculating about humanity’s far-term expansion into the universe beyond the limits of our solar system—with an emphasis on the changes humans will undergo as a species as we make this happen. Is interstellar travel so far beyond our current imaginings that it will take a fundamental transformation of humanity in order to make it possible? And, if so, will we remain Homo sapiens or become a new and unique species: Homo stellaris (the People of the Stars)? Herein are original science fiction stories by award-winning authors such as Kevin J. Anderson, William Ledbetter, Todd McCaffrey and Sarah A. Hoyt, supplemented by accessible nonfiction essays describing the science behind the fiction from people who should know—Sir Martin Rees (Astronomer Royal of the United Kingdom), Mark Shelhamer (Chief Scientist for the NASA’s Human Research Program), and more. This collection of original stories and essays was inspired by a gathering of scientists, science fiction authors, and futurists at a series of annual meetings held by the Tennessee Valley Interstellar Workshop. Let their speculations, imaginations and boundless sense of what’s possible take your own journey beyond the edge of the solar system in STELLARIS: PEOPLE OF THE STARS!